Sir William Drury was an English statesman and solider of Elizabeth I. He was born in Hawstead, Suffolk, the son of Sir Robert Drury of Hedgerley and Elizabeth Brudenel in Buckinghamshire. As the third son of his father he knew had no great hope of an inheritance and so he left Gonville College, Cambridge at 17 without his degree, to make his own way in the world and began his career as a soldier. His first expedition was in 1544 where he joined Sir John Russell into France during the joint invasion by Charles V and Henry VIII. During the campaign he took an active part in both the sieges of Boulogne and Montreuil, but had the misfortune of being taken prisoner during a skirmish in the neighborhood of Brussels. After being ransomed, he served for a short time at sea, becoming "an excellent maritimal man" and in 1549 returned to assist Lord Russel once again in suppressing a rebellion that had broken out in Devonshire. For a time Drury had a more subdued life and stayed out of public life, his only noted appearance being his participation in a tournament held by Edwards VI. Ten years later however, shortly after her accession to the throne, Elizabeth I dispatched William Drury to Edinburgh to investigate the government of Mary of Lorraine and to view the new fortifications of Leith. During the investigation Drury once again had again the misfortune to fall into the enemy's hands; but beyond a short detention seems to have suffered no other injury, for in October 1560 he married Margaret, daughter of Thomas, lord Wentworth, and widow of John, last lord Williams of Thame. In February 1564, he was then appointed to succeed Sir Thomas Dacre as Marshall and Deputy Governor of Berwick, an office which he continued to fill until 1576. During this time he was a close observer of Mary Queen of Scotts and her house-arrest in Loch Leven Castle. His letters regarding the progress of events in Scotland and her escape from that place are among the most important state documents relative to this period. After her escape, and fearing French involvement into Scotland, Elizabeth sent Drury to lead two raids into Scotland; the first in April 1570, where he accompanied the Earl of Sussex. Ninety castles and strongholds razed to the ground and three hundred towns and villages in flames marked the course of the army through Liddisdale, Teviotdale and the Merse. On 11th May, he was knighted by the lord-lieutenant the Earl of Sussex and was once again sent into Scotland, this time with an army of 80 lances, 230 light horse, and 1,200 foot under his command to continue similar actions. These armies were later recalled by agreement with the queen of Scots, who promised, in return, that no French troops should be introduced into Scotland, and that the English rebels should be delivered up to the queen by her partisans. At least three more times he went to that country on more peaceable errands, during which his life was continually in danger with assassination attempts. In 1576, he was sent to Ireland as president of Munster, where his stern rule was very successful. In 1578 he became Lord Justice to the Irish Council, taking the chief control of affairs after the departure of Sir Henry Sidney. 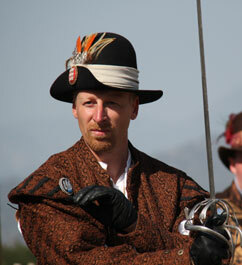 In 1579 he knighted Sir William Stanley, one of his captains during a campaign against the Earl of Desmond. Only a few months later Sir William Drury died himself of fever, to be buried in St. Patrick's Cathedral.